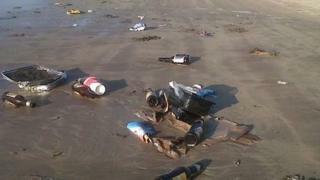 Beaches in Cornwall have more than twice as much rubbish as the UK average, according to a report. The Marine Conservation Society (MCS) said rubbish levels increased on beaches in England by more than 10% from 2013 to 2014. The society said the situation in the South West was "grim", with Cornwall in particular getting "a rough deal". Tourism bosses said thousands of volunteers cleaned beaches in Cornwall every year. Charlotte Coombes, MCS beach watch officer, said: "It's a bit of a grim situation in the South West as a whole. "Across the UK we recorded nearly 2,500 pieces of litter per kilometre. In the South West that's over 3,300 and in Cornwall unfortunately it's more than 5,500." In the MCS report the South West refers to Cornwall, Devon and Dorset. In Devon the MCS found more than 2,900 pieces of litter per kilometre and in Dorset more than 1,100. Ms Coombes said: "Cornwall does get a bit of a rough deal - its position means a lot of stuff can wash across the Atlantic." She said the popularity of South West beaches also added to the litter problem. Malcolm Bell, chief executive of Visit Cornwall, said beaches in the county were generally "pristine" through the summer with more litter in the winter months. He said more than 2,000 people took part in beach litter picks before Easter in 2014. Beaches in Wales had the highest litter levels in the UK while rubbish on coastlines in Scotland and Northern Ireland fell, the report said. The report was based on litter found by more than 5,000 volunteers on 301 UK beaches, from 19 to 22 September last year.